Welcome to the USS Endeavour! The Federation has been rocked by war more than one time in the past century. It has had conflict with the Romulans, the Klingons, the Borg, and ever so recently, the Dominion. Though the last such conflict was over a decade ago now, and the Federation policy makers hope to once again look outwards towards scientific explanation, their peacekeepers Starfleet are much more pragmatic. They understand that the interlude between conflicts is just that; an interlude. A temporary state of being before the next conflict, whenever that may be. And they know that we must be prepared for this. They also know that we must do everything in our power to deter our closer and more predictable neighbours from beginning the next quadrant-spanning battle. It is for that purpose that the Sovereign class exists. Designed to defend against the Borg - the most deadly threat to ever face the Federation, even with the focus of their gaze turned elsewhere, she comes equipped with a variety of top-of-the-line technologies designed with one thing in mind; battle. Even her very space frame is designed in such a way as to make a potential aggressor think twice about whether they would want to attack this mighty beast. And yet, for some reason there's always somebody in the galaxy ignorant enough to do just that. But then, Starfleet cannot operate on its own. It must bow down before the will of the policy makers on Earth and in the Federation Council. And so they have been incorporating all of the aspects of traditional Starfleet values into this mighty vessel; sophisticated sensor arrays and stellar cartography labs; the very finest in diplomatic facilities; the epitome of research equipment and the very best intellectual minds the quadrant has to offer. It is through this blending of design ethos that the Sovereign class has become an all-round Ship-of-the-Line, capable of performing almost any task that Starfleet needs of her. And the Endeavour is the very best of her class. Captain Byrne and his crew have been assigned now to the Galactic South for two years, and in that time they've made the second ever known contact with the Metrons, been flung to a far-off galaxy and back again, done battle with ship-infesting beasts of the insect variety, and discovered an ancient secret whilst negotiating trade agreements. Who knows what the next adventure on board will be? With the Captain and Lieutenant Kessel now a member of the Borg Remnant, can the remaining crew of the Endeavour complete their mission, and stop the lone cube from returning to the Collective with a disastrous piece of technology? 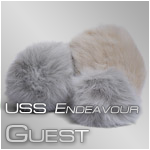 The USS Endeavour is a 13+ rated Role Play. We insist that any writers wishing to join the ship be 13 years of age or older. OK guys, the last posts of 'Remnant, Part II' are out! I'll be sorting out the move over to the Highlander now. The new URL is http://highlander.pegasusfleet.net - all of your user accounts were moved over a little while back, so you should all be able to log straight in. Let me know if you have any problems. The fleet is restarting its post of the month awards process, and they've put up the vote for the posts submitted for December. OK everyone; I've taken the database of all of your user accounts and characters to transpose them on to the Highlander site; all of your login information and character bios should be preserved, but it means that any changes you make on this site between now and the move will not be carried over. So if you do many any changes - any additions to your bio, change your password, etc - then you need to let me know so that I can copy over the relevant piece of the database. The lights on the bridge flickered weakly. Even the emergency lighting was failing, leaving most of the bridge to be lit by the failing glow of those consoles still active. "Come on!" McIntyre shouted to the small huddle of officers who had congregated in the corridor on Deck Two, before calling out to a Petty Officer who was clearly headed for the Bridge. "You can't get up that way- the launch mechanisms on the pods are busted!" I speak this log with the unhappy news that I have missed my son. A last minute change to the Endeavour's orders has seen me miss meeting Jarvis by a matter of hours.